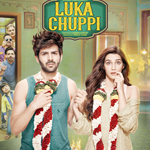 Download Luka Chuppi (2019) Songs. Luka Chuppi is directed by Laxman Utekar. Music Composed by Tanishk Bagchi, White Noise, Abhijit Vaghani and its release date is March 01,2019. Luka Chuppi is a 2019 Movie and it contains 5 Mp3 Songs that can be downloaded below.